Effect of Venice Painters on European Art. For details, see: History of Art. For periods/styles, see: Art Movements. The heirs to the great flowering of 16th-century Venetian painting were to be found not in Venice itself (where talent declined rapidly after 1600) but in Amsterdam, Antwerp and Madrid; Rome, Paris and London. The Italians Caravaggio and Annibale Carracci; the Netherlandish masters Rubens, Anthony Van Dyck and Rembrandt; Poussin and Velazquez - these geniuses, whose example inspired and dominated fine art painting in Europe for some 250 years, as they still preside over our real and imaginary museums, drew much of their sustenance from the painting of the Venice Renaissance, which thus moved from the borders of Italian art (to which the historian/painter Giorgio Vasari wished to consign it) to the very centre. Some of these painters actually visited Venice itself, but some did not; for during the course of the seventeenth century Venetian pictures spread to cities throughout Europe. When the young Rembrandt was urged to go to Italy to improve his style, he claimed that there was no point in doing so, because it was easier to see Italian Renaissance art in Amsterdam than to travel from town to town in Italy itself. We will see that this claim was not wholly unreasonable. The process had begun in the lifetimes of some of the masters shown here. By the middle of the 1530s Titian (c.1485/8-1576) had not only painted a famous portrait of the Emperor Charles V, but had also been invited to Spain to paint his wife and son. (See also: Venetian Portrait Painting 1400-1600.) After some hesitation Titian declined to make the journey, but his pictures did so in increasingly large numbers, for members of the Habsburg court became by far his most important patrons, and it was for them that he executed some of his greatest portrait paintings. Francis I of France was also painted by Titian (who had to make use of a medal to obtain a likeness, as he never saw the King) and tried unsuccessfully to attract the artist to his court; but on the whole it was Renaissance art in Florence and Rome rather than of Venice that was patronised and collected at the Fontainebleau School (c.1530-1610) in France. Tintoretto (1518-1594) and Paolo Veronese (1528-1588) were less widely known outside Italy than was Titian, though it seems that after 1576 some of Veronese's most splendid pictures were painted for the collection of the Emperor Rudolph II in Prague; and one can assume that his portrait of the young Sir Philip Sidney (now lost) must have attracted attention in England as Sidney's fame grew ever brighter. For details of drawings by Tintoretto and Veronese, see: Venetian Drawing (c.1500-1600). At the very end of the 16th-century there occurred the first major dispersal of Venetian pictures from their original destination. In 1598 Ferrara fell into the hands of the Papacy, and The Feast of the Gods by Bellini (and Titian), together with Titian's The Andrians, Bacchus and Ariadne and Worship of Venus, all of which had been painted for a special room in the castle of Alfonso d'Este, were taken to Rome. Their impact was not seriously felt for a generation, but thereafter it can hardly be exaggerated. (Please see also: Titian and Venetian Colour Painting c.1500-76.) 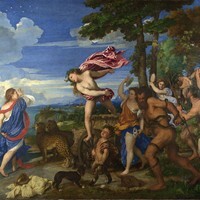 In the 1620s, Nicolas Poussin was only the greatest among a number of leading artists in Rome who agreed that 'Titian never executed anything more gay, charming and beautiful, since art and nature are presented together with the greatest delicacy in every part'; and we constantly find beautiful echoes of these Bacchanals by Titian both in Poussin's own works and in those of other seventeenth-century painters - nowhere more so than in the wonderful transcriptions (in Stockholm) made by Rubens (at some uncertain place and date) of The Andrians and The Worship of Venus. To the great distress of Italian Baroque artists, in 1638-39 these two paintings by Titian were sent to Spain, where the reign of Philip IV (162165) saw an astonishing accumulation of pictures by all the greatest Venetian masters. When Velazquez (1599-1660) arrived in Madrid in 1624 he could already have seen the supreme group of Titians which had been assembled by Charles V and Philip II, and we are told that when Rubens paid his second visit there in 1628 he copied every Titian in the royal collection. Three years later Velazquez paid his first visit to Italy, during the course of which he apparently brought back to Spain further Venetian pictures - including a work by Jacopo Bassano (1515-92), and throughout this period others were arriving to enrich the collections of the King and his courtiers. It was in 1650, however, that Velazquez paid a second visit to Italy, for the specific purpose of buying works of art for Philip IV, and acquired masterpieces by Tintoretto and Veronese. By then great pictures by these and other Venetian artists could also be seen elsewhere in Europe. During the sixteenth century the Gonzaga rulers of Mantua had been among the most active patrons of Venetian painters, from Andrea Mantagna (1430-1506) onwards, and when in the 1620s their collections were sold to Charles I, London could almost rival the riches of Madrid in this field; for Lord Arundel, the Duke of Buckingham and other noblemen were also building up magnificent collections of paintings, among which Venetian works were given special prominence. The overwhelming majority of these were to leave England for ever during the era of Cromwell, but the impact they made can happily still be seen in the portraits and very rare mythologies painted in England by Anthony Van Dyck (1599-1641), who himself owned some superb Venetian pictures, including Titian's Vendramin Family, now in the National Gallery, London). While Charles I was still (just) alive, another great collection of Venetian art was broken up when Prague was looted by Swedish troops in 1648. Masterpieces by Veronese were sent to Queen Christina in Stockholm, and when a few years later she abdicated and began her travels through Europe she was able to add to them Titians of superlative quality. 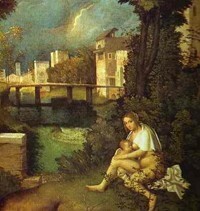 These pictures were eventually installed in her palace in Rome, and although much admired they did not, alas, stimulate the painters there as fruitfully as Titian's Bacchanals from Ferrara had done a generation earlier. Only one artist of real quality, Pier Francesco Mola (1612-66), took full advantage of this new opportunity to study the finest Venetian art at leisure; and early in the eighteenth century the Queen's pictures once more resumed their travels - this time to France. The dispersal of the collections of Charles I, the Duke of Buckingham and other English noblemen following the defeat of the Royalists in the Civil War brought more great Venetian pictures on to the market than ever before - or since; and many of the best art museums in Europe still owe their principal holdings in the field to this extraordinary sale. Philip IV of Spain (who years earlier had presented Charles I with his first Titian) did well out of the occasion. And it is now that, for the first time, a significant quantity of high quality works by Venetian artists came to Paris - though they were for the most part bought by a German banker who was acting on behalf of the Italian Cardinal Mazarin, who was the effective ruler of France. But it was the Low Countries that - temporarily - benefited most from the downfall of Charles I. For many years Amsterdam had been the centre of the European art trade, and outstanding Italian pictures were bought and sold there. It was this that prompted Rembrandt (1606-69) to claim that it was no longer necessary to go to Italy to study Italian oil painting - and to be able to justify that arrogant claim by the marvellous use to which he put the opportunities open to him. Major Venetian pictures featured prominently in the private cabinets that were assembled in the city, and in 1648 the earliest (and most important) book devoted to the Lives of the Venetian Painters was dedicated to two brothers in Amsterdam who were building up a superb collection there: it is not unreasonable to think of these volumes as constituting, at least in part, an elaborate sale catalogue. And when Lord Arundel's pictures were transferred from London to Holland as the Civil War drew near, there were among them many attributed to Giorgione (1477-1510), Titian, Tintoretto and Veronese. In the Habsburg Netherlands (which today constitute much of Belgium) Venetian pictures were equally accessible. Rubens (1577-1640) himself had for a time owned a fine collection in Antwerp. He was not alone, and when in 1646 the Archduke Leopold Wilhelm, son of the Emperor Ferdinand II, was made Governor General of the provinces, he established in Brussels one of the greatest of all European collections of paintings, most of which are now in Vienna. For the lover of Venetian art his collection is the most evocative of all those built up in the seventeenth century, for, in his enthusiasm to make his treasures widely known, the Archduke instructed his chief curator, the painter David Teniers the Younger (1610-90), to paint a number of views of his gallery. See, for instance: The Archduke Leopold Wilhelm's Picture Gallery (Kunsthistorisches Museum, Vienna). Even though the arrangement of what is to be seen in them may not be entirely accurate, these captivating views allow us to gaze at his pictures with the collector himself and his courtiers. We can see the ranks of Giorgiones and Titians and Tintorettos, some of them supreme masterpieces, some of them the unworthy recipients of optimistic attributions - and some sold from English collections. Moreover, not satisfied with this, the Archduke commissioned an illustrated catalogue of his collection (one of the very first ever to be produced), and in order to assist the engravers who were engaged on the task, Teniers himself painted small copies on panel of some of the most admired works. A group of these panel paintings can still be seen in the Courtauld Institute Gallery, London, and through them (and others now scattered throughout the world) we can get a remarkable impression of the appeal made by painters of the Venetian Renaissance to the artists of the Dutch Baroque and Spanish Baroque of the seventeenth century - and also an invaluable record of the appearance of pictures that are now lost. Venetian paintings continued to leave first Venice, then Italy, and then Europe; but by the second half of the seventeenth century superb examples were already to be seen in most centres where great new art was being produced. The impact made by such painting was by no means always welcomed by theorists. But to art lovers it may well seem to have been the one artistic influence that has been invariably beneficial. We gratefully acknowledge the use of material from Francis Haskell's article on Venetian Paintings, published (1983) by the Royal Academy, London.  For a chronological guide to the development of Italian painting, see: History of Art Timeline.  For information about 16th century painting in Venice, see: Homepage.